July 17, 2015 Fact of the Day: Are Millionaires using online video and social media for investment information? DID YOU KNOW THAT, WHEN IT COMES TO USING TECHNOLOGY, MILLIONAIRES ARE MOST INTERESTED IN OBTAINING INFORMATION ABOUT THEIR ACCOUNTS? 77% of Millionaires want to have on-line access to their personal investment account information. In addition, 52% would like to be able to have consolidated account information where they can view accounts that they have from multiple investment providers. Interest in all other potential technical capabilities pale in comparison. 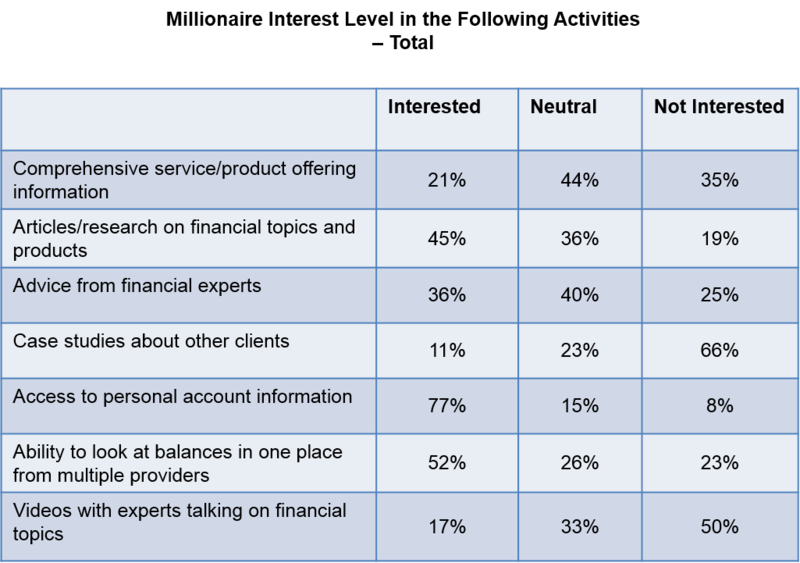 Only 36% are interested in online advice from financial experts, 21% seek service or product information, and 17% are interested in videos of experts talking about financial topics. Use of online services, however, varies by age and will continue to change.